The historical context of this article was 1998 and before 9/11, when certain Western nations supported the Muslims in Kosovo to strike the Orthodox in Serbia. There is much written here that can still apply in our contemporary situations, which is why I submit it for study. Lately we see a rapprochement between the Western world and Islam. Muslims are expanding in Western societies, creating communities and building mosques in prominent places. Apart from Europe I noticed such an upsurge in Vancouver, Canada. The movement of Western Christians appears first in the study of the Koran, and so there are conferences, lectures, etc. On the other hand, there is also an approach of Western Christian nations with nations ruled by Islam. Of course, there is also a fear of Western people over the expansion of Islam. We also see today a strong collaboration of Western governments and Muslim nations, but at the same time a disregard for Orthodox peoples. A most expressive example is what is happening today in the Balkans. I firmly believe, and I can support it with evidence, that this is not only a diplomatic move on the international chessboard that simply has to do with political interests, but it is a move that has to do with the whole mentality of Western man. It has been rightly observed that history could be read in conjunction with theology, and vice versa. It is a fact that historical choices created and changed the western world, just as theological alterations created ideological-historical data. That is, all the ideological and political systems and patterns created in the West, such as capitalism, Marxism, agnosticism, atheism, enlightenment, nihilism, etc. came from a reaction to a theology that was removed from the original theological context of the Orthodox Church. Through this prism we must see the approach between Western Christianity and Islam. I'm pretty certain, even if at first sight it seems paradoxical, that Western Christianity (Roman Catholicism and Protestantism) is theologically more akin to Islam than to Orthodoxy. In the West there dominates the view of the Protestant theologian Harnack that Orthodoxy is the pagan view of Christianity. So in the entire theology and lifestyle, Westerners understand Muslims better than the Orthodox. Of course I do not have here the opportunity to further develop this foundational, in my opinion, part of the issue, but simply to highlight a few points telegraphically. Islam speaks of the oneness of God, and of course His essence, as it developed later in Sufism, while there is a simultaneous devaluation of Christ, which is why love cannot develop between God and man. This theological position can be perceived by Western Christians, because they talk about the pure energy of God, His essence, and not of the person with the meaning and importance developed by the Fathers of the fourth century, who identified the person with the substance (hypostasis). Essentialism remains in the West, but when the person is spoken about it remains unsubstantial; it is simply a personalism. Thus, the ontology of the person and interpersonal-hypostatic relationships are unintelligible to Western Christians. The Koran also is distinguished by its anthropocentrism and its realistic and sociopolitical character. Later, however, when Sufism developed in Islam, it created a mysticism associated with Neoplatonism. Westerners are distinguished by the same mentality, having socialized the Gospel they have associated it with an ontological character, but they also speak of an eastern-type mysticism. 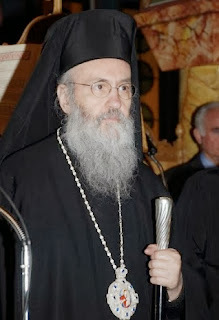 The Greek Orthodox tradition insists on addressing ontological problems, without altering its theology, what it says about God, and it sees sociological phenomena through genuine theological contexts, and in this way they do not secularize the message of Revelation. Also, Islam promises a worldly-dominated blissful happiness, the fulfillment of all desires and sensations of the faithful, but also a mental blissful happiness after death for the followers of Allah. Western Christians better understand this blissful happiness, despite the ascetic life of the Orthodox Church which ascetically aims at overcoming blissful happiness. The same commonalities are observed in other issues, such as the issue and source of Faith. For the Muslim the Koran is the revelation of God, and the redemption of the believer depends on the book and its reading. This mindset is also found among Western Christians, for whom the Bible is the word of God and the only source of faith, which is why Westerners better understand the Muslim perception of Revelation rather than the Orthodox, for whom the Gospel is not a Revelation but words about the Revelation. Also, the commonalities between Western Christians and Muslims can be seen in issues about war, Theocracy, etc. which we cannot expand upon here. I repeat that the relationship between Nations and their cultural traditions and religions should not be seen only through political expediency, but through theological contexts. This is why today in Greece we should pay great attention to our Orthodox Tradition and its original expression, which is a shield for our nation. This is what constitutes our nobility, which cannot be perceived by Western Christians and Muslims, and therefore it represents our consciousness. Source: Ekklesiastiki Paremvasi, "ΜΟΥΣΟΥΛΜΑΝΙΣΜΟΣ ΚΑΙ ΔΥΤΙΚΟΣ ΧΡΙΣΤΙΑΝΙΣΜΟΣ", June 1998. Translated by John Sanidopoulos.